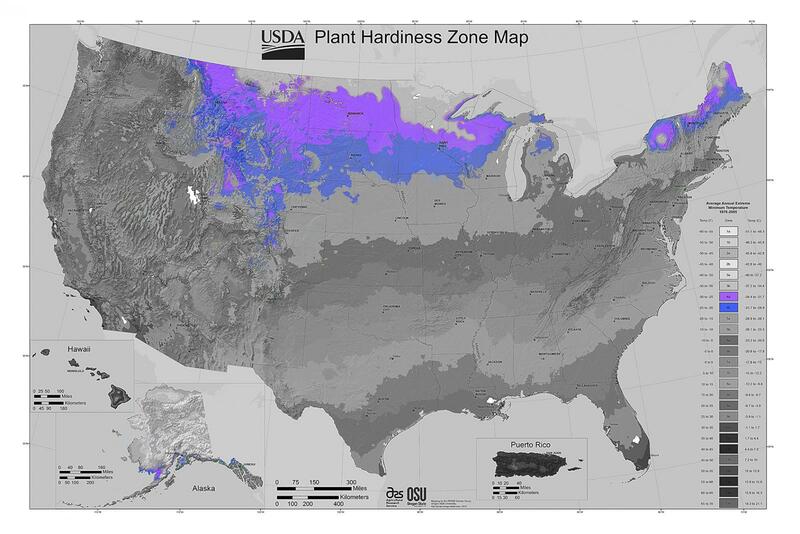 The USDA (United States Department of Agriculture) Plant Hardiness Zone Map is divided into 13 zones. Like all zones, Zone 4 has two subsets, 4a and 4b. These zone designations are guides for selecting plants that will survive the cold temperatures in these regions. Each zone is separated by a 10°F difference. Zone 4 is 10°F colder than Zone 5. Zone 5 is 10°F colder than Zone 6. Zone 4: There is a minimum average temperature of -20°F to -30°F for Zone 4. 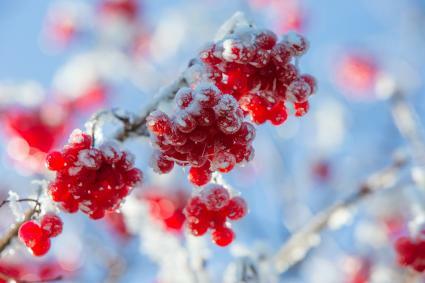 Zone 4a: There is a minimum average temperature of -25°F to -30°F for Zone 4. Zone 4b: There is a minimum average temperature of -20°F to -25°F for Zone 4. There are often lower temperatures in the zone and subsets due to unusual weather patterns and unexpected weather changes. These average temperatures should be taken as base for typical weather. Zone 4 is one of the shortest growing seasons of the USDA zones. The first and last frost dates can fluctuate a week or two, but as a general rule, frost dates are used for zones to plan garden planting. Last frost date: May 15 to June 1 is usually the last frost range for Zone 4. First frost date: September 15 to October 1 is usually the first frost range for Zone 4. To stay current on frost warnings, download a frost date app. All you have to do is enter your zip code to access your regional timeframe. In 2012, gardeners saw a slight change in the zone boundary when the USDA updated the Plant Hardiness Zone Map. They discovered the new map showed a 5°F half-zone increase over the 1990 map. The National Gardening Association stated the change was most likely due to newer weather mapping technology combined with greater participation in weather stations providing data to the USDA. Each state has more than one zone due to the differences in climate and topography. Some have multiple hardiness zones. For example, Montana has four different zones. There are 22 states that have Zone 4 regions. There are many vegetables, fruits and other trees and plants that can be successfully grown in Zone 4. Nut trees that grow in Zone 4 include, English and Black walnuts, Northern pecans, Chinese and American chesynuts, King Nut hickory and a few others. 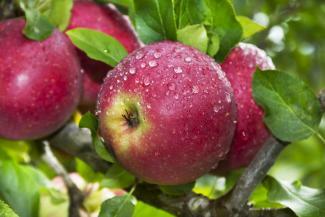 Fruit trees for Zone 4 include, pear, apple and cherry trees. Only sour cherries thrive in Zones 4-6. Sweet cherries require temperatures found in zones 5-7. If trees are designated 'hardy' then they are typically suitable for growing in Zone 4. Fruit trees require a certain number of 'chill days' in order to produce fruit. Chill days are the amount of days needed at temperatures 32°F -45°F. Zone 4 requires more chill days than zones 7 or 8. 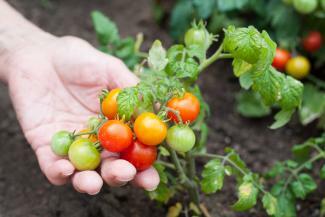 Vegetables, such as beans, and cool weather crops, corn, cucumbers, squash, tomato, peppers and many others can grow in Zone 4 summers. Be sure to check plant tags and seed packets for zones. Zone designations are based strictly on temperatures, but there are many other factors to consider when planting a garden, trees or landscaping your yard. These include droughts, microclimates, soil fertility/conditions, rainfall and unusual weather changes/patterns. You can find this information in Sunset's The New Western Garden Book. Zone 4 has a short growing season, but you can sow seeds indoors to counter this. Be sure you understand what plants grow best in your zone before investing time and money.